by Nilupaer Abudukeyoumu, Marianela Garcia-Munoz, Yoko Nakano, Gordon W. Arbuthnott. Cholinergic interneurons (ChIs) are sparsely distributed within the striatum, a nucleus that plays important roles in voluntary motor control, associated learning, procedural memory, execution of movement, action selection, and planning. ChIs comprise 1-3% of all striatal neurons, are the main source of striatal acetylcholine, and have long been associated with deficits in Parkinson’s disease. A striatal imbalance between dopamine and acetylcholine has been suggested as one of the causes of parkinsonism. To selectively deplete ChIs in the dorsolateral striatum of 21-day-old male mice (C57BL/6J), we used the saporin immunotoxin that targets choline acetyltransferase (Anti-ChAT-SAP, Cat. #IT-42). Experimental animals received a stereotaxic unilateral infusion of the targeted toxin (0.3μl/3min) and sham controls received the same volume of sterile saline (sham control). Our histological analysis encompassed Weeks 2-6 postsurgery performed at 2-week intervals (Fig. 1). The loss of cells reached a stable ~70% level by 4 to 6 weeks with the additional surprising finding that axon terminals stained with a vesicular acetylcholine transporter antibody were more numerous two weeks after the injection, returning to control levels by six weeks. 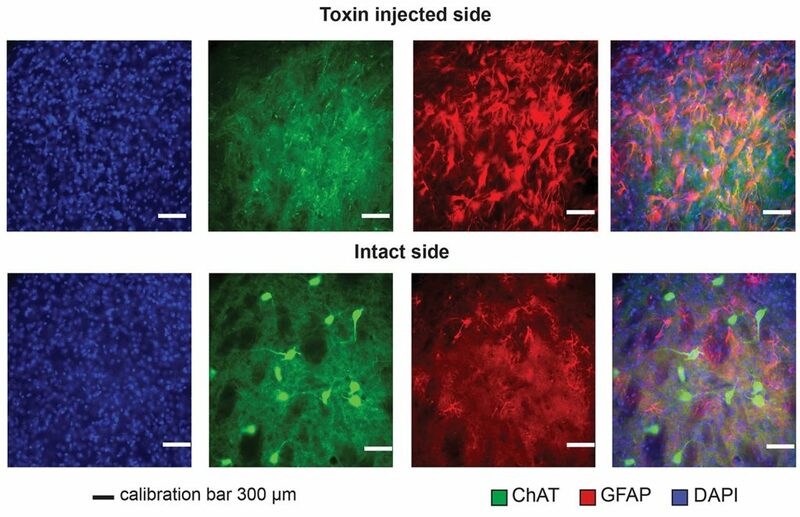 From a functional point of view, it will be important to find out if despite the cell loss, axon terminals sprout to invade the Anti-ChAT-SAP injected area from ~30% surviving ChIs or from ChIs in the surrounding tissue. 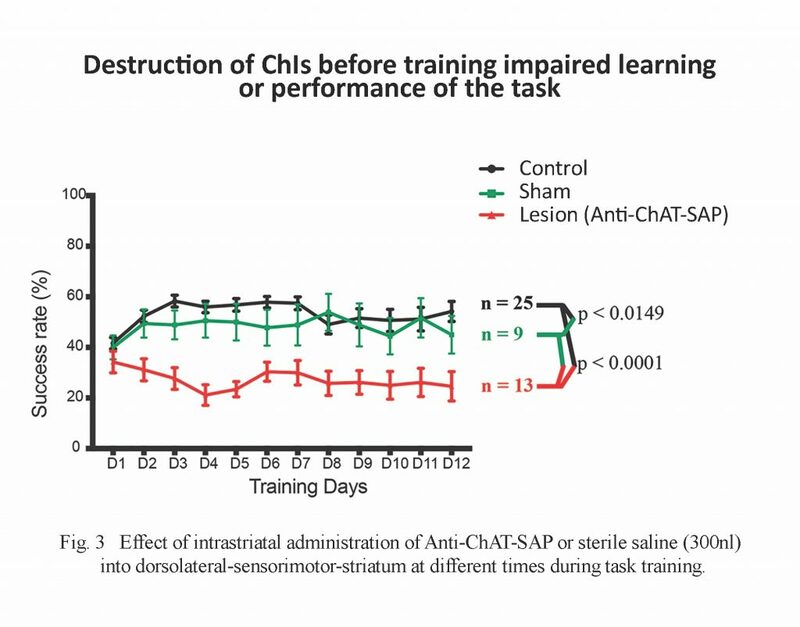 To begin the study of dorsolateral striatal function following Anti-ChAT-SAP-induced ChI loss, we followed the same procedures as before and observed the animal’s perfomance in a reach-to-grasp task (Fig. 2). 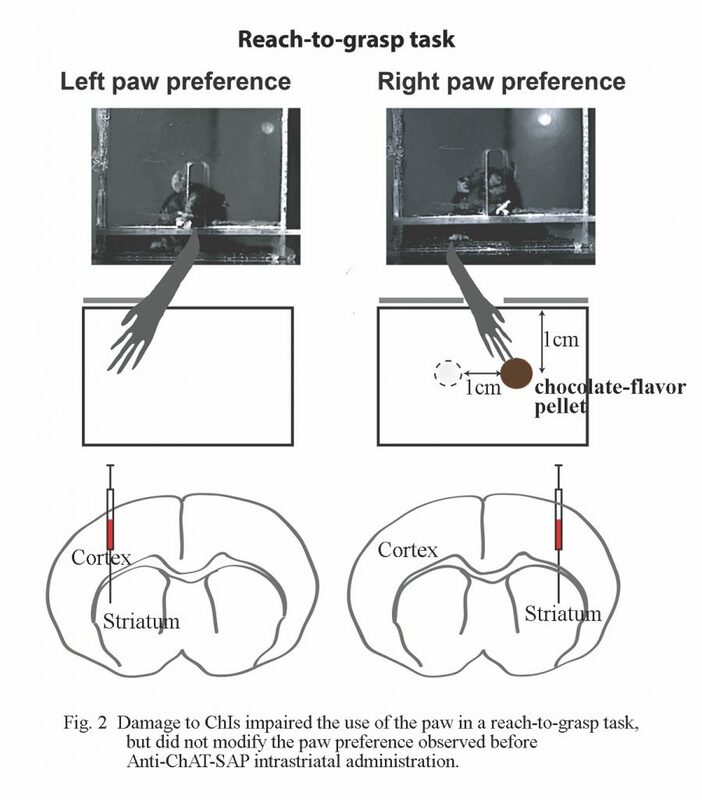 Mice were divided in two control groups (intact and sham) and one experimental Anti-ChAT-SAP-injected group. Training started one week postsurgery during the animal’s active circadian cycle and following 12 hours of food deprivation. Once the animals passed the initial acquisition phase, the successful performance in the reach-to-grasp task — expressed as mean ± SD percentage is shown in Fig. 3. The significantly-impaired performance of the experimental group compared to controls was present even when the animals were pretrained. The loss of ChIs impairs the performance of striatally-mediated motor tasks, which suggests that cholinergic synaptic function is more important than non-synaptic communication in this situation. A non-synaptic cholinergic tone may be important for setting functional striatal states in other circumstances, however, these specific lesions of ChI cells suggest that performance of a learned forelimb task requires that the cholinergic synaptic circuits of the striatum are intact. Abudukeyoumu N, Hernández-Flores T, Garcia M, Arbuthnott, G. Cholinergic modulation of striatal microcircuits. (2018). Eur J Neurosci. 10.1111/ejn.13949. Aosaki T, Miura M, Suzuki T, Nishimura K, & Masuda M. Acetylcholine-dopamine balance hypothesis in the striatum: an update. (2010). Geriatr Gerontol Int., 10 Suppl 1 S148-157. 2010/07/16. Lopez-Huerta VG, Nakano Y, Bausenwein J, Jaidar O, Lazarus M, Cherassse Y, Garcia-Munoz M, & Arbuthnott G. The neostriatum: two entities, one structure? (2016). Brain Struct Funct, 221 (3):1737-1749. 2015/02/06. PMC4819794. Pittman-Polletta BR, Quach A, Mohammed AI, Romano M, Kondabolu K, Kopell NJ, Han X, & McCarthy MM. Striatal cholinergic receptor activation causes a rapid, selective and state-dependent rise in cortico-striatal beta activity. (2018). Eur J Neurosci. 48 (8):2857-2868. Liu A, Aoki S, Wickens J. (2017) A Streamlined Method for the Preparation of Gelatin Embedded Brains and Simplified Organization of Sections for Serial Reconstructions. BioProtoc. 7(22). DOI: 10.21769/2610. Aoki S, Liu AW, Zucca A, Zucca S, Wickens JR. (2015) Role of striatal cholinergic interneurons in set-shifting in the rat. J Neurosci 35(25):9424-9431. Aoki S, Wickens JR. (2015) Anti-ChAT-SAP elucidates a causal role in behavioral flexibility. Targeting Trends 16(4). Kucinski A. (2015) Impairments in gait, posture and complex movement control in rats modeling the multi-system, cholinergic-dopaminergic losses in Parkinson’s Disease. Targeting Trends 16(1). Xu M, Kobets A, Du JC, Lennington J, Li L, Banasr M, Duman RS, Vaccarino FM, DiLeone RJ, Pittenger C. (2015) Targeted ablation of cholinergic interneurons in the dorsolateral striatum produces behavioral manifestations of Tourette syndrome. Proc Natl Acad Sci USA 112(3):893-898. LaPlante F. (2013) Role of cholinergic neurons in the nucleus accumbens and their involvement in schizophrenic pathology. Targeting Trends 14(1). LaPlante F, Dufresne MM, Ouboudinar J, Ochoa-Sanchez R, Sullivan RM. (2013) Reduction in cholinergic interneuron density in the nucleus accumbens attenuates local extracellular dopamine release in response to stress or amphetamine. Synapse 67(1):21-29. LaPlante F, Zhang ZW, Huppe-Gourgues F, Dufresne MM, Vaucher E, Sullivan RM. (2012) Cholinergic depletion in nucleus accumbens impairs mesocortical dopamine activation and cognitive function in rats. Neuropharmacology 63(6):1075-1084. LaPlante F, Lappi DA, Sullivan RM (2011) Cholinergic depletion in the nucleus accumbens: Effects on amphetamine response and sensorimotor gating. Prog Neuropsychopharmacol Biol Psychiatry 35(2):501-509.